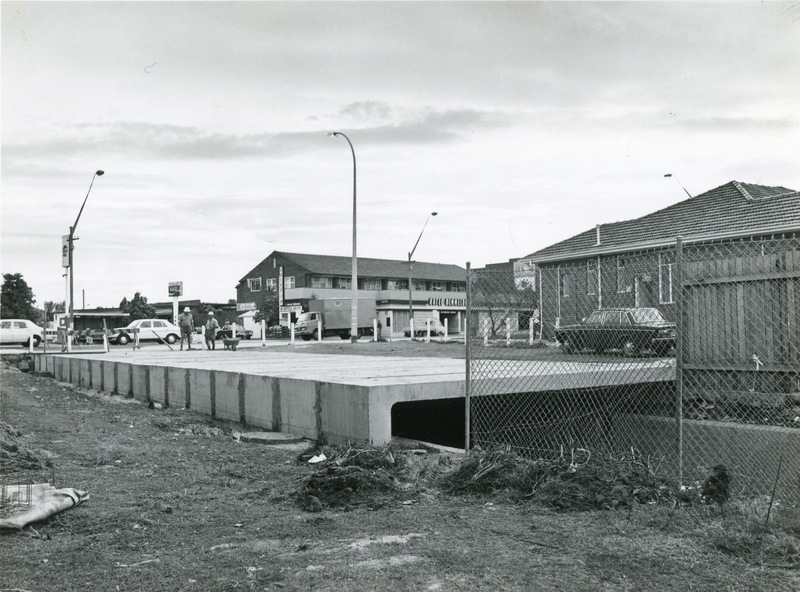 Lots to see in this bold shot from 1981 – check out the Mobil on the corner; Granny crossing the street on the right (on her way back from shopping, by the look of it. Remember when you could do that? ); the No Right Turn onto Stoney Creek Road (heaven forbid! ); the wide, spacious King Georges Road trailing off into the M5-less distance; the boxy pedestrian buttons; that eerie church just above Granny. But does it really look all that different today? These days, we can turn right from one busy road onto another; the ancient (although obviously post-1981) Chinese restaurant blocks the view of the eerie church; the Mobil has been replaced by Pancakes on the Rocks; the roads seem narrower and there are a hell of a lot more cars, and yet the air is allegedly cleaner. Must be all those extra trees. Oh, and NO PIZZA HUT. Beware: no in-depth, lengthy history lessons today, no no. Today, we’re talking about leftovers. 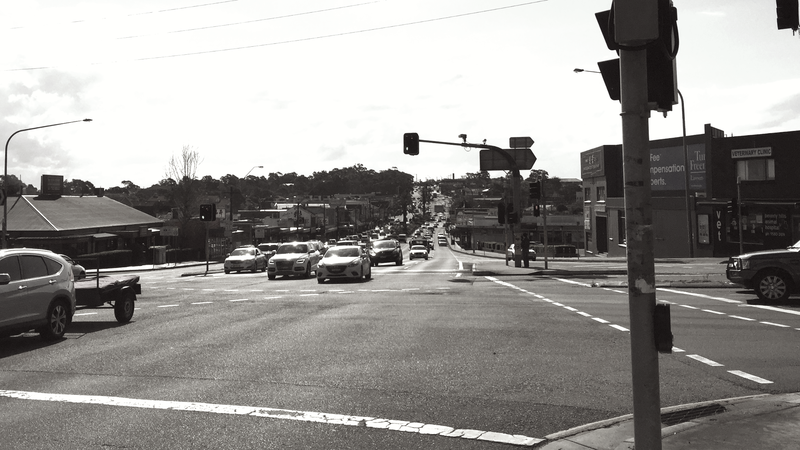 Kingsgrove: a short distance from the eternal struggle between gridlock and bustle that is Stoney Creek Road lies the Kingsway. Or is it just Kingsway? Breathe that in and savour it for a moment. It’s the Kingsway, as if once upon a time the tiny street in the middle of suburban nowheresville was intended as a way for a king. Not too far away is the majestic King Georges Road itself, so it’s not a stretch. Sometime prior to 1948, powers that be (though I’m assuming not a king) decided that the Kingsway was suitably epic to receive a strip of shops, with the prime side facing Stoney Creek Road. The occupants have varied over the years, but are invariably interesting: a dodgy pizza place, a spy shop, the mysterious Rassan Trading, that damn doll hospital. But around the back, along the Kingsway, the shops aren’t as commercial…although they’re just as interesting. A place specialising in large print books. An antique glass shop. I’m gonna say that one more time: an antique glass shop. And further along, this. 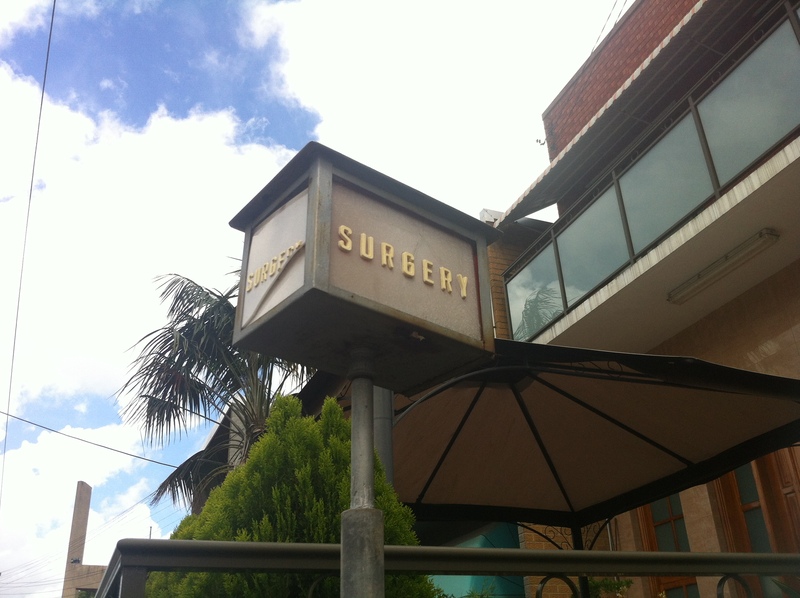 When I was a kid, these surgery signs instilled a feeling of dread. Surgery happened at these places, I thought. Surgery, a word that to this five-year-old’s mind meant that seedy doctor’s surgery in Batman where Jack Nicholson asks for the mirror. In any of these otherwise nondescript buildings, bad dudes could be having bullets pulled from their faces by shady GPs. But the reality was a lot less interesting. British English dictates that the workplace of a doctor is a surgery (or a practice, but if the streets were peppered with little red boxes bearing the word practice, society would never get anything done), and since British English also dictated what we Australians did for a long time, surgery it was. Whoever the current tenants are, I’d like to thank you. Thank you for leaving this little sign up in what passes for your front yard, either through laziness or a twisted sense of style. As soon as you see it, you’re forced to imagine all the sick people who would have attended this place in its heyday, the relief and sorrow that came with each pronouncement from the GP. The lives that ended, and the foretelling of new life. I personally wouldn’t want to live there (too creepy), but it’s nice to know that the experience is possible. 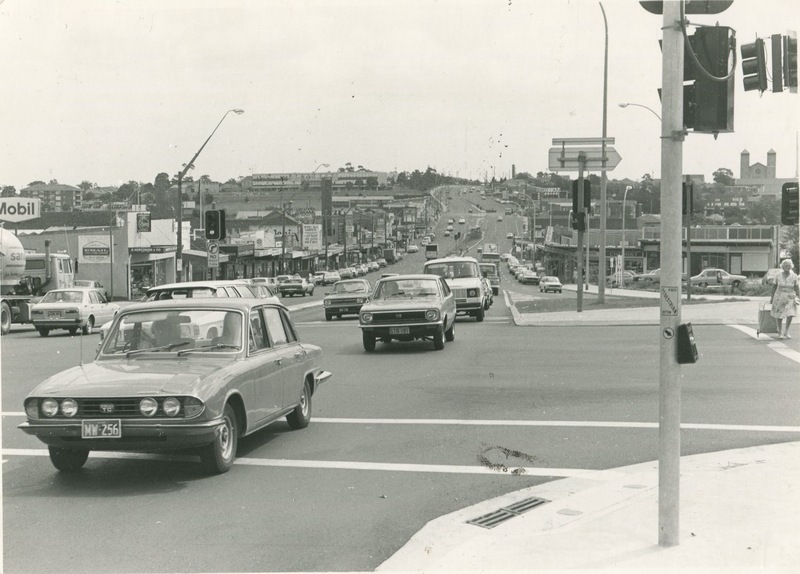 This photo, taken from what is now a car park across the road, shows that the Beverly Hills Hotel was once called the Hotel Bennelong, that there was some kind of Coke-sponsored diner next door to it, and oh, what’s that tall sign on the far left? I can’t quite read it. And if you think the BHH is rough these days, imagine how it must have been back then. There’s a reason those guys are wearing hard hats. Of greater interest is what’s happening in the foreground: the council is hard at work putting in the stormwater canal that now runs parallel to the East Hills train line all the way from here to Wolli Creek. On the far right, caught in the midst of all this progress is some dude’s house. As he makes his way to and from work, then to and from the pub each day, little does he know that in a matter of years his home will become the local baby health centre…but that’s a story for another day. To the future! In this context, 2014 sounds much more futuristic than it does as say, the expiry date of your driver’s licence, doesn’t it? The most striking aspect of the futurescape is the abundance of palm trees, installed to help lend Beverly Hills a Californian vibe. Counteracting this vibe is everything else pictured, especially the intrusive presence of the cameras. I know they’re there for our safety, but still – very Orwellian. 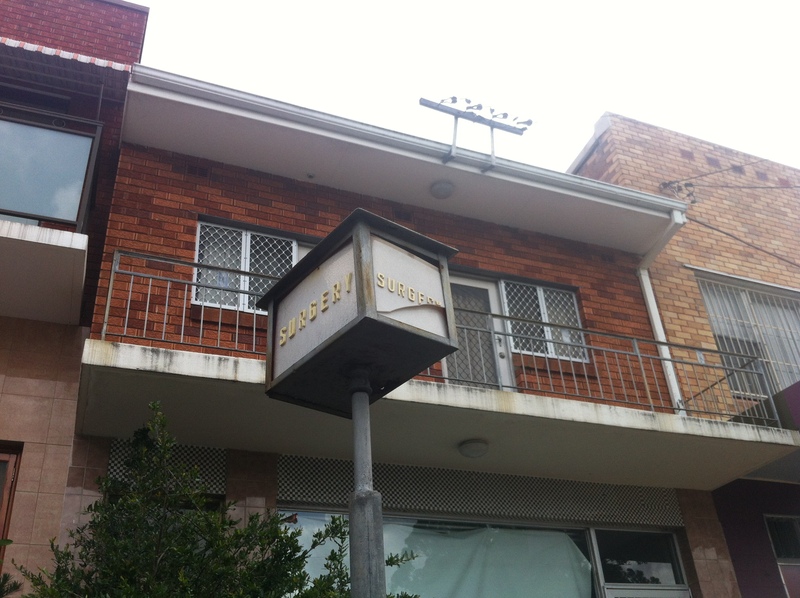 It’s interesting to note that the hotel and Hepburn Court beside it remain largely the same as they were 33 years ago, and at this point I’d like to repeat that for any readers born in 1981 – 33 years ago. Let’s cut to the chase: the Beverly Hills Cinemas are looking a little…porky these days. It’s hard not to notice the expanding waistline anymore, even for the sake of politeness. What I’m saying is, if the Beverly Hills Cinemas were a person, they’d need to take the Michelle Bridges challenge a few times to squeeze back into those trackpants. But it wasn’t always this way. Back before the cinema was built, the suburb was known as Dumbleton, after a nearby farm. The opening of the Dumbleton train station in 1931 had opened up the suburb to the rest of Sydney in a way the previous public transport option – a coach service from Hurstville station – had not. Dumbleton’s first shop had only opened in 1908 (on the site of the present day Beverly Hills Hotel), so there wasn’t exactly a major reason to go there. Dumbleton residents hoped to change this in 1910, when a post office was opened within the existing store. It was like the proto-Westfield. 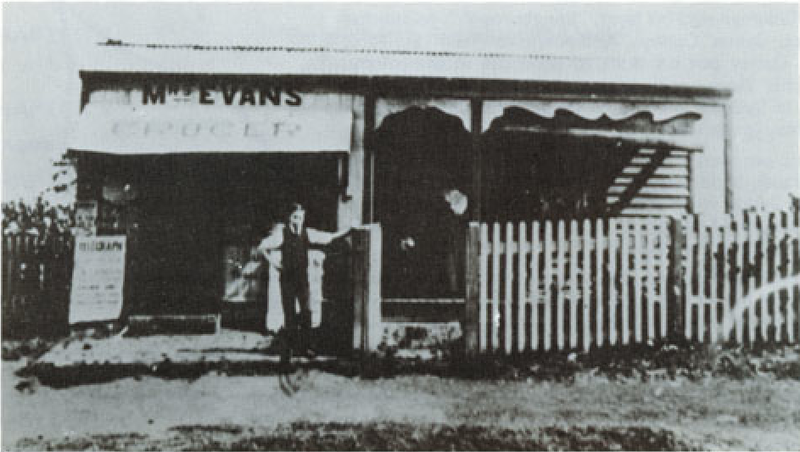 This is that shop, circa 1916. Image courtesy Regina Coeli Parish, Beverly Hills. The Second World War brought military personnel to Dumbleton, further increasing its population and forcing it to come up with more shops to keep people entertained, but it’s kinda hard to make anything entertaining when your suburb’s name is Dumbleton. 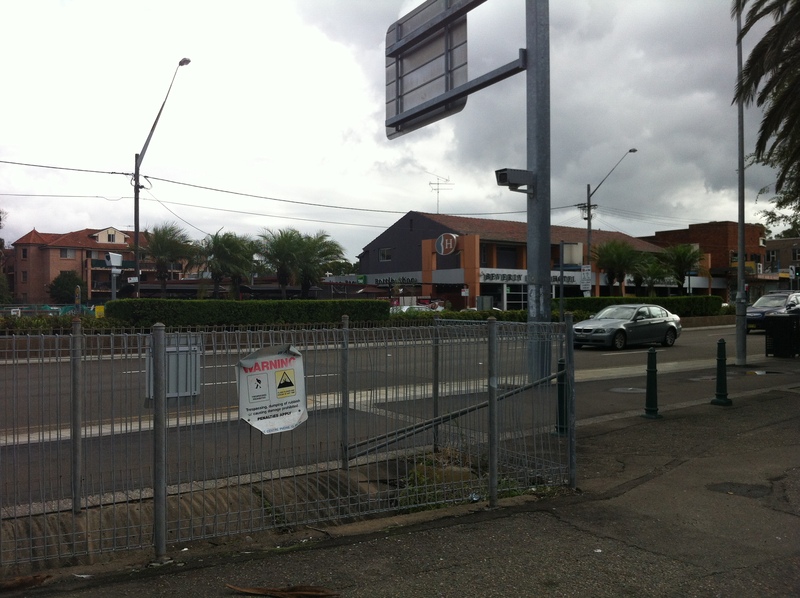 In late 1938, plans began for a picture theatre along King Georges Road with a projected completion date of 1940. 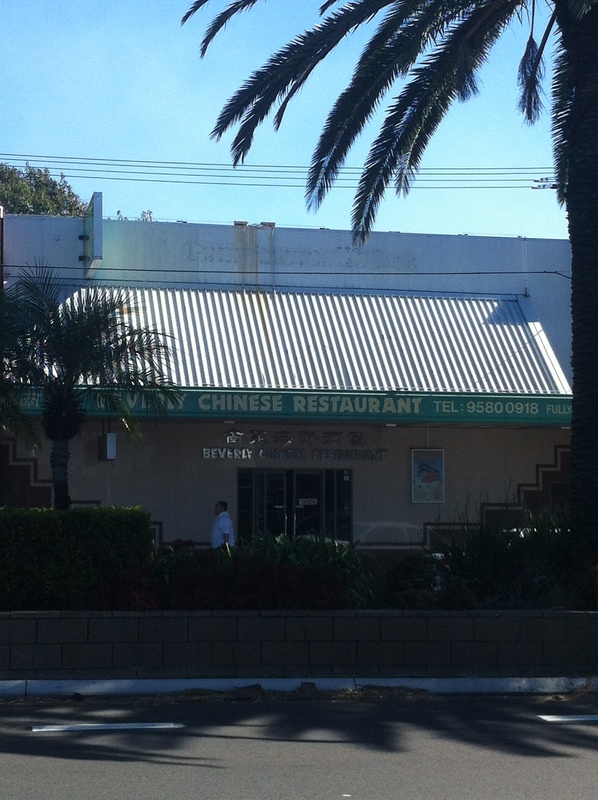 I suppose the Dumbletonians were hoping to emulate the success of the Savoy theatre in nearby Hurstville, but they still had the nagging problem of that name. 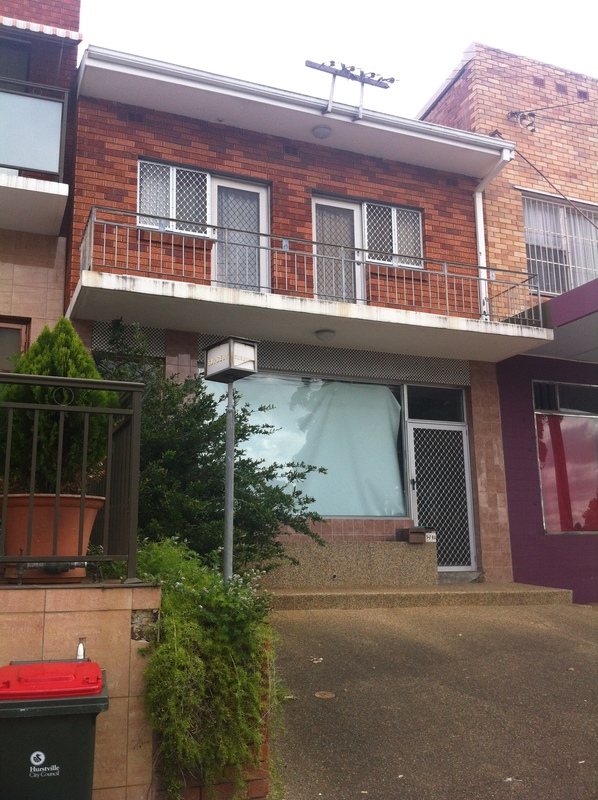 An American cultural influence had been building in the outskirts of Sydney with the advent of cinema, so with an impending theatre and the belief that the USA would soon be joining the war effort, a move was made in 1940 to change the suburb’s name to the much more glamourous sounding Beverly Hills – Hollywood on the East Hills line. The Californian equivalent was home to famous movie stars, and with the completion of the St. James Theatre later that year, so would Dumbleton. The strip of palm trees down the centre of King Georges Road was added to complement the Hollywood theme in a move no one in the 1940s could have predicted would become so tacky by the present day. The St. James Theatre entertained the residents of the growing suburb (even those older residents who had loudly complained about the name change) for decades until the 1970s, when the voracious Hoyts incorporated it into its suburban chain. By 1978, it had fallen into disrepair like many of its suburban cousins that had survived the mass demolition of such cinemas during the progressive 60s, and was showing only adult films. St. James indeed. I wasn’t able to locate a picture of the St. James back in the day, so if you’re able to help, let me know. It was that year when developer Jim Tsagias bought the St. James, with plans to transform it into a function centre. Something changed his mind (perhaps the palm trees) and he decided to restore it as a cinema. 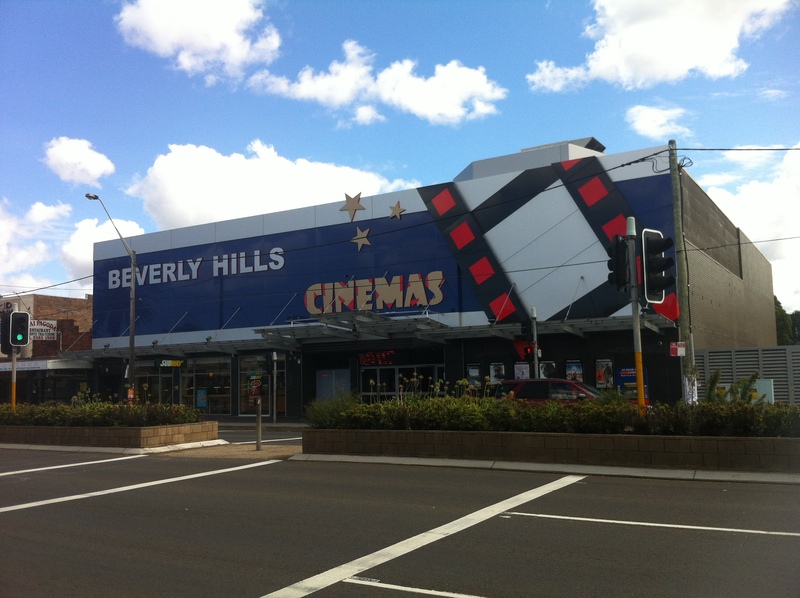 In 1982 it was reopened as the one-screen Beverly Hills Cinema, and in 1988 it was converted to a twin. And couldn’t you tell. For years, the bigger Cinema No. 1 would play host to the big budget blockbusters, while smaller, more intimate pictures or films late in their run were relegated to the tiny Cinema No. 2, which had been shoehorned in above the first. 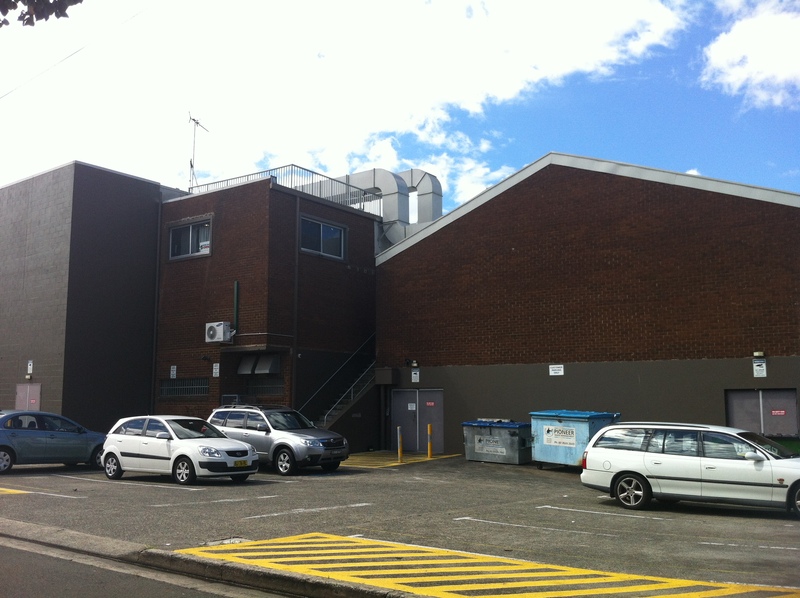 It was an awkward setup, but one that built a reputation as the cheapest cinema in Sydney (based on ticket prices, of course), and became one of the most popular family venues in the south west, especially when coupled with the nearby Beverly Hills Pizza Hut. Movies then all-you-can-eat pizza: it doesn’t get much more 90s than that. The cinema was looking a bit dated by the early 2000s, but not as bad as the bank next door (I believe it was a Westpac?). Sandwiched between the cinema and the Pizza Hut was one of so many suburban bank branches closed during that time, and it sat dormant for many years just like the Hut. Perhaps realising it wasn’t a good look, and that there was an opportunity to expand, the Tsagias family bought the bank in 2004 and moved in, creating a video arcade in the new space which greatly relieved pressure from the cramped waiting area. But this wasn’t enough. In 2008, a complete redevelopment saw the Beverly Hills upgraded to a six-screen cinema. The derelict Pizza Hut was cut in half to make room for more screens and a mini-power station, and the entire facade facing King Georges Road was given the facelift (in true Beverly Hills fashion) that it sports today. Not quite the case around the back, though. From the alley behind the cinema, it’s easy to see the layout of the original St James and the bank next door. The structure on the extreme left is new, and sits on the Pizza Hut’s territory. The Pizza Hut recently vanished from existence, perhaps to make way for more parking for the cinema, or a new restaurant (just what BH needs). Whenever you see extensive renovations going on, it’s usually a safe bet that it’s being done to prepare the property for sale. Sure enough, the Tsagias family placed the Beverly Hills Cinema on the market late last year. It seems as if Event Cinemas has taken control, at least of the screening coordination, but it remains to be seen if the Beverly Hills will remain a cinema under a new owner. If it doesn’t, they may have to change the suburb’s name again.